A technician with a lifelong drive to prove – to himself if no one else – that he’s at the top of his game has been named the Canadian Technician of the Year. Brian Madeley, owner of Madeley Automotive Diagnostic Services in Kingston, Ont., was chosen by a panel of judges from 48 nominees in the first-ever award contest established by Canadian Technician magazine. The title is not all he’s won. The award comes with $5,000 in cash and $10,000 in prizes donated by the sponsors of the competition: Snap-on Tools of Canada; Robert Bosch, Inc.; Spicer Professional Grade Chassis; Mevotech; and ChevronTexaco. Described as “an ambassador for his industry,” Madeley easily met all the criteria for the award, which is designed to celebrate the technician as a whole person – highly skilled, well trained, customer oriented, and community minded. some very interesting hobbies such as horology (the collection of fine watches) and flying. Madeley has exhibited an uncompromising drive for excellence since arriving in Canada from England in 1989. Courted by a Kingston BMW dealership, he left his homeland to pursue his profession here. Though he passed a trade exam which allowed him to work in Canada, he opted to take it a second time to earn an interprovincial ticket. “Even though I had no interest in working anywhere else in Canada, I had to prove it to myself that I could do it,” he says. His biggest stumbling block was learning Canadian mechanical terminology. “For example I’d never heard of a brake rotor in my life. I’d only known a rotor as a part of the distributor. In England, it’s a brake disc. Similarly, he earned his ASE Master Tech status because he couldn’t stand the thought that there were qualifications out there that he didn’t possess. He stayed at the dealership for six years until they moved to a flat-rate pay system. Four months after leaving the dealership he started Madeley Automotive. “The transition to business management wasn’t too hard,” he says. There was a lot to learn but he built slowly, bringing in apprentices as needed and training them through to their licenses. Through the process, he came to understand what makes a good tech. It’s a quality he sums up in a single word: desire. Madeley wants employees who push themselves, much the way he pushes himself. His shop operates now with four people turning wrenches – himself and another licensed technician, and two apprentices. It does mean that he’s been doing more work in the bays lately, but it’s work he enjoys. Madeley’s approach to running the business is as demanding as his expectations in the bay. He takes the ethical temperature of every situation, expecting nothing less than total honesty and morality in business. “Look, you can make more money being tougher, being more aggressive in selling repairs, and perhaps being a bit of an alarmist, but it’s certainly not my way of doing things,” he says. “I will sometimes tell people that a vehicle is not worth spending any money on. It’s not that I don’t want to do the work. It’s just that I’d hate it if someone thought I’d put my own interests ahead of theirs, keeping a clunker on the road, or pushing through an unnecessary repair.” He admits that the ethical approach to automotive repairs comes at a price. He’s constantly trying to educate his customers about the importance of proper maintenance… and how it will save them money in the long run. And he’s not shy to try unusual business tactics to earn his customers’ trust and loyalty. He once contracted an image consultant to address his staff to talk to his staff about their presentation and how to deal with female clients. “At the time, I had been having problems with an employee who was always very dirty and it occurred to me that if he ever had to run a customer home, or work at the desk in my absence, he could ruin my reputation for running a clean shop,” he says. The session gave everyone a better understanding of how presentation helps build acceptance and trust, especially from female customers. His wife, Judy, says dealing with female customers has always been his strong suit. She adds that he’s very patient with his customers, never giving the impression of being tough and gruff, like what someone might think of a mechanic. When Madeley is not in the shop, he has some interesting outside hobbies that keep him busy. For example, you might find him at the local track, racing his 20-year-old Porsche 944. 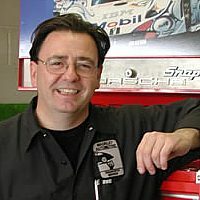 But the hobby inspired him to become an authorized Porsche Technical Inspection Centre, so that local Porsche owners wouldn’t have to drive all the way to Ottawa or Toronto to get ready for races. 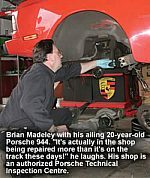 The status doesn’t bring in much extra business, but it may lead to referrals since the opinions of Porsche owners on where to get a car serviced might carry some weight with consumers. Similarly, he earned his motorcycle technician’s license because he figured motorcycle owners probably also own cars, or will someday own cars. And if he’s not in his Porsche, he might be in a two- or four-seater airplane, accumulating even more hours toward his eventual pilot’s license. He gets animated as he flips through the watch magazines in his reception area. (“The customers always wonder what these magazines are doing here!”) He points out interesting new time pieces and examples of new time-keeping technologies – such as a new watch with 13 drive belts, referred to as a V4 because of it’s similarity to a timing belt driven engine. He owns about a dozen high-quality watches, displayed at his home. They’re not necessarily old but they’re known for their quality workmanship. Most are self-winding watches which must be kept on a machine which turns them to keep them losing time. “Everyone has outside interests,” he says. “Mine are still mechanical. I guess you just stick with what you love.” It’s a philosopher that he takes to work every day.